Stir ingredients together and serve garnished with a cinnamon stick. There are two safe ways to make your cocktails glow-in-the-dark. You can use a black light to bring out an eerie glow in appropriately colored beverages or you pick up light-up ice cubes or glow sticks that are made to be used in beverages. What you SHOULD NOT do is take any old glow stick and drop it in your glass – that’s just not safe (and let’s be honest – do you know where that thing has been?) Gross! There’s one secret you need to know for most of your glow-in-the-dark cocktail needs is that the quinine in tonic water glows bright under a black light. 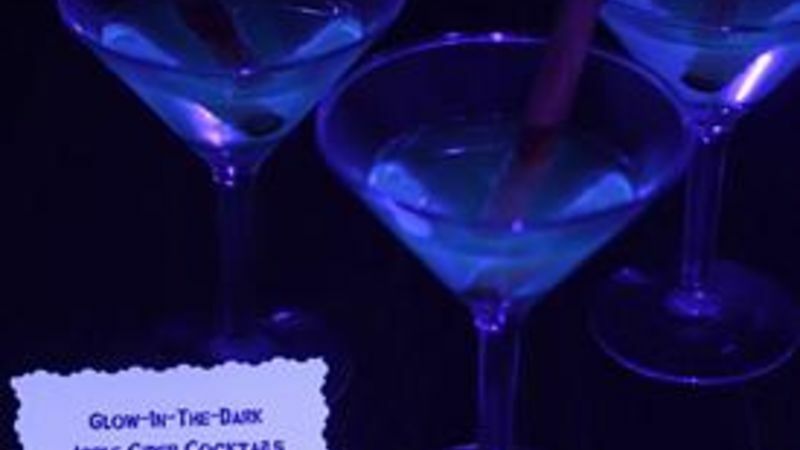 Here are more spook-tacular glow-in-the-dark drink tips and recipes for Halloween cocktails. Glow-in-the-Dark Apple Cider Cocktail: Go fruity and blend rum, tonic water and apple cider. Add a black light and you’ve got Glow-in-the-Dark Apple Cider Cocktail. Glow-in-the-Dark G&T: Since tonic water glows, this means that the easiest glow-in-the-dark beverages may be ones you’ve probably enjoyed dozens of times -- a simple gin and tonic. Mix three parts tonic water with one part gin in a highball glass with ice, throw on a lime garnish, flick on the black light and watch your beverage glow. Glow-in-the-Dark Ice Cubes: You can make any clear beverage glow in the dark by making your ice-cube with tonic water. This is great for folks who don’t drink alcohol (a.k.a. the kids) who may want to see their beverage light up along with the boozier ones in the room. Fill your ice trays half with tonic water and half with distilled water (if you do all tonic, the cubes will melt way too fast). When the cubes are done, drop them in that drink and prepare for some illuminated action. Oh, and if you really want to be creepy, you can make those glowing orbs look like eyeballs by using ice ball molds like the one in the Glow-in-the-Dark Eyeball Jelly Shots recipe. Hate Tonic Water? Try a White Russian or a White Russian Float: What if you hate tonic water (or are allergic to quinine)? You can get into the glowing action with some standard cream-based cocktails. Of course these drinks are white, which means they’ll give off that special hue once the black light hits them. The easiest is surely the old-school White Russian, a blend of equal parts vodka, Kahlua and cream served in a rocks glass over ice. Or make it a dessert and try the White Russian Float. The Kahlua does give it a little bit of brown coloring, but it doesn’t drown out the luminescence once that black light is flicked on. If you want to go all out – throw those light up ice cubes into a glass of gin and tonic and turn on the black light. Now that’s a beverage for a proper Halloween toast.